♕【Enhanced Edition】Embedded with " 15 " super strong magnets, surround almost entire wrist,With two small pockets, plastic parts are placed. perfect for holding nails, drill bits, fasteners, bobby pins, bolts, washers, pins,wrenches and small tools,much more. ♕【Comfortable and Long-lasting】Made of durable 1680D ballistic polyester, along with breathable padded mesh inner layer, provide the rapeutic relief to your wrist.The breathable mesh and lightweight design allows maximum comforts for the whole working day. 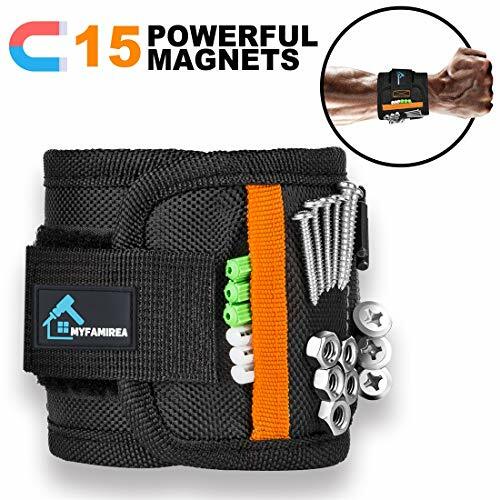 ♕【Lightweight and Convenient】Ideal for many woodworking, home improvement, and do-it yourself projects,An extremely good helper like your third hand. Greatly help you hold all the small metal objects. No worries from searching for small parts in the toolbox or your pockets, fully improving your work efficiency. ♕【HAVE TIRED OF THOSE HEAVY TOOL BOXES? 】Yeah, it is inconvenient to carry especially climb wooden ladders. This magnetic wristband is lightweight and portable. Less than 70g, it is a Ideal for many woodworking, home improvement and DIY projects. ♕【UNIQUE GIFT】Perfect home improvement and toolbox accessory.Unique Xmas Gift Toolband for husband, father ,boyfriend, guys,roofers,construction,mechanics,DIY-er, do-It Yourselfer and just about anyone. If you have any questions about this product by MYFAMIREA, contact us by completing and submitting the form below. If you are looking for a specif part number, please include it with your message.